Just this last weekend, I catered a party with one of my close chef friends, Kristen Schumacher. For me, there is nothing more fun than geeking out over cook books while planning a dinner party menu, especially when your co-chef is also a fan of local and seasonal cooking and not afraid of experimentation. In the summer months, ingredient options seem endless and with a little bit of inspiration, ordinary ingredients can be transformed into delicious dishes. Given the small size of the group, (nine) and a good budget, we were able to focus on ingredients and take extra care for plating. 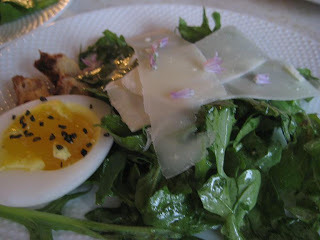 For the salad course we tossed arugula and finely chiffonade sorrel with a honey citrus vinaigrette and topped each salad with shaved pecorino, chive blossoms and a soft-boiled duck egg sprinkled with black Hawaiian sea salt.